Hawkedon is one of the strangest places in Suffolk. There's nowhere else quite like it. Here, in the rolling landscape between Haverhill and Bury, is where the Chiltern Hills come to die. On their journey through Bedfordshire and Essex they become lower and softer, with occasional last stabs at glory before sinking beneath the Suffolk heathlands. Rede, the next parish to Hawkedon, is the highest point in East Anglia. You can climb up into Hawkedon from neighbouring Hartest and Stansfield, and when you do you find a few ancient houses and a pub scattered about a wide village green that forms the highest point in the parish. And right in the middle of the green is St Mary. Its walled churchyard is surrounded by the green on all four sides, and it is the only church in Suffolk where this is so. One of the finest sights the county has to offer is on a summer's evening, approaching the green from Hartest, and watching the sun sink low behind St Mary's tower. The building itself is a fairly typical rural west Suffolk church. Take away the 14th century tower, and all you have is a simple Norman church augmented by a chancel and elaborated with later windows; but there are no aisles, no clerestory. The windows, and the delicious south porch, are a reminder that this was the wealthiest and most populous part of England in the 15th century. It is an intimate space that you let yourself into, full of surprises. Beneath a beautiful, curved early 20th century gallery, what is probably the original Norman font is one of Suffolk's best. It is also rather unusual, being unsymmetrical. It may be that it was once square, and has had two corners sawn off. I don't think it was designed to be an irregular hexagon in plan. On it are carved primitive designs that might represent a sheep's horns. four of the five supporting pillars have been replaced, but the most easterly is original. It must have been very dramatic before restoration. Now lost to us unfortunately is the St Christopher wallpainting that the Victorians uncovered; it has almost completely faded, and mere glimpses of it can be seen beside the hatchment that now hangs there. Opposite, there is a vast royal arms on the north wall. The artist seems very keen to have asserted the masculinity of the two supporters. Interestingly, the arms themselves are Stuart - but this claims to be from 170 years later, and George II. Clearly, it is a reused set of Charles II arms, the C cunningly fashioned into a G. At some point in between, it appears to have served as the royal arms of Queen Anne. Turning east, there is plenty more to excite and interest. First, there are the bench ends, similar in shape and scale to those at Withersfield. One shows a defaced wild man sticking out his tongue while two griffins beneath salute him. On another are three bearded oriental men wearing hoods (the Three Wise Men, perhaps?) and a third shows an exquisitely carved woman in front of three ears of corn. The most curious shows two lions apparently supporting a man who has what appears to be a thick rope around one of their legs. The more you look at them and try to interpret their religious iconography, the more you get the feeling that these carvings may not, after all, predate the Reformation. They are almost as if someone in the 17th century perhaps had wanted to create beautiful bench ends carvings and had seen something like these elsewhere. It may well be that the poppyheads themselves are medieval, but had been defaced. The oriental gentlemen are very like the faces on the misericords at Stowlangtoft, and some of the others could be heraldic. The woman, however, is a mystery to me - she appears medieval, but entirely secular. At the east end of the nave, the old rood screen has been taken down to its dado, but part of the sequence of images survives, although it has been severely battered. Only one of the figures on the panel is really recognisable now, and that is St Dorothy with her basket of flowers. 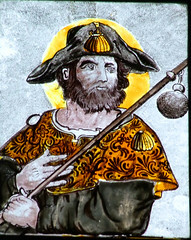 Another figure with a pilgrim staff may well be St James the Great. Stepping through, the east window contains survivals of the medieval glass. It is not unusual to find collections of fragments gathered from elsewhere like this, but here they are of good quality, well presented and with some interesting details. Several heads of saints and kings survive, including one almost complete figure and another made up of parts of several, lots of crowns and even parts of inscriptions. You can make out the words Virgo and Justice. There is a wolf, an eagle, a shell of St James, three ears of corn. The fragments are haunting, and the sequence must have been stunning in this lonely place. Another curiosity is the sequence of continental Saints in the upper lights of the east window. They are probably genuine, but they were copied in the early 19th Century by the Lowestoft artist Samuel Yarrington, and can be seen again across the county at Lowestoft St Margaret. Until the 1930s, you could still make out a wall painting over the east window. This is an unusual place, but it was an unusual subject; it showed the Transfiguration, a new Catholic Church devotion right on the eve of the Reformation. The only other Suffolk representation of it survives at Westhall. In the chancel, curious crawling creatures climb the edges of the choir stall desks. A glowering and, Mortlock suggests, entirely pagan late 17th century memorial is set at an angle facing south-east. It includes some vulgar little cherubs. I came back here in February 2013 with a friend of mine who works at national level for a church conservation charity. He had not heard of Hawkedon before , and was quite blown away by it, counting it among the hundred or so best churches he had visited in England - and, as he has visited more than ten thousand, that's saying something. It made me think that along with Westhall this place is one of Suffolk's best kept secrets. 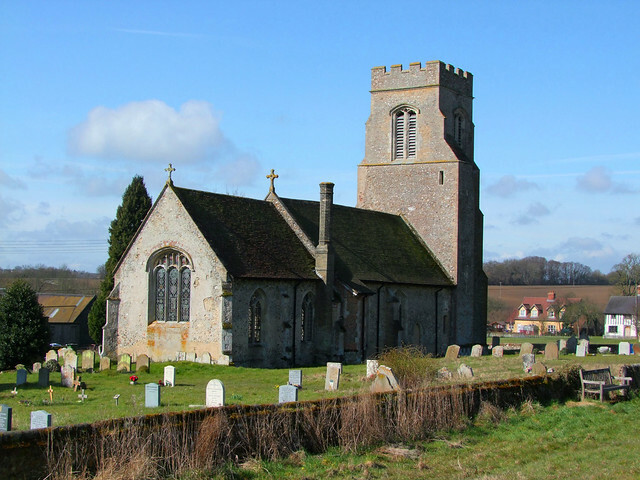 Like Westhall, Hawkedon did not make it into Simon Jenkins' England's Thousand Best Churches. If that means that those people who slavishly visit his choice of churches to the exclusion of all others miss Hawkedon, then it probably serves them right.